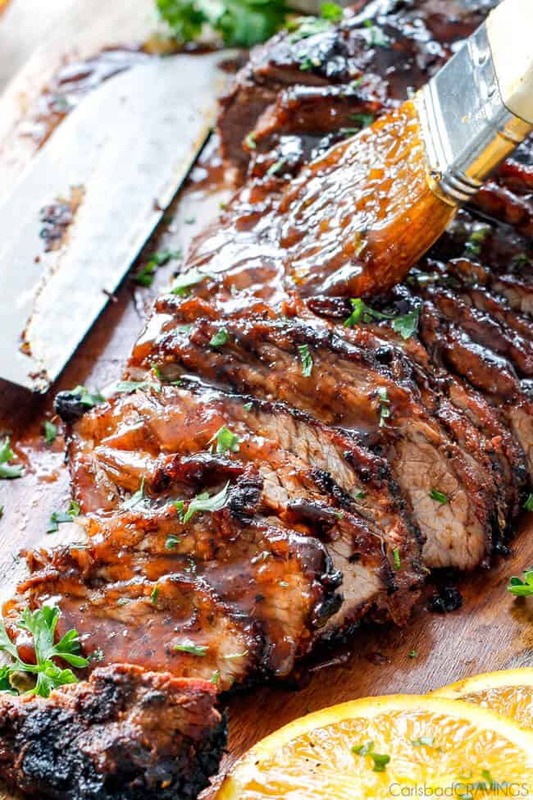 Crazy juicy, tender Grilled Cajun Steak seeping with flavor from the most amazing Cajun steak marinade and Cajun spice rub all complimented by sweet tangy Apricot Orange Glaze that is lick your plate delicious! Incredible alone or makes the most amazing sandwiches and wraps! I kind of missed the boat in posting this Grilled Cajun Steak in time for Labor Day so although you don’t have a dedicated holiday to grill up this juicy, Cajun rubbed hunk of deliciousness, I hope you still fire up the grill all the same and simply celebrate LIFE with this Cajun Steak! In addition to this steak, I’m celebrating life this week by heading to Kauai with some blogging friends so if you aren’t following me on Instagram and want to join the fun, I’m going to be posting plenty of Instagram Stories so come say hi! and eat steak. I had already taken my photos of this Cajun Steak and I was ready to pack up the no longer warm leftovers when two friends came over to help us move a few large pieces of furniture. They told me they were “full” and had already eaten dinner but in just a few minutes only a sliver of steak remained. Even one of our friend’s daughters had her fair share. I think they liked it. And what is not to love about this restaurant quality Cajun steak?! Its seeping with flavor through and through thanks to both a Cajun Steak Marinade and Cajun Rub. 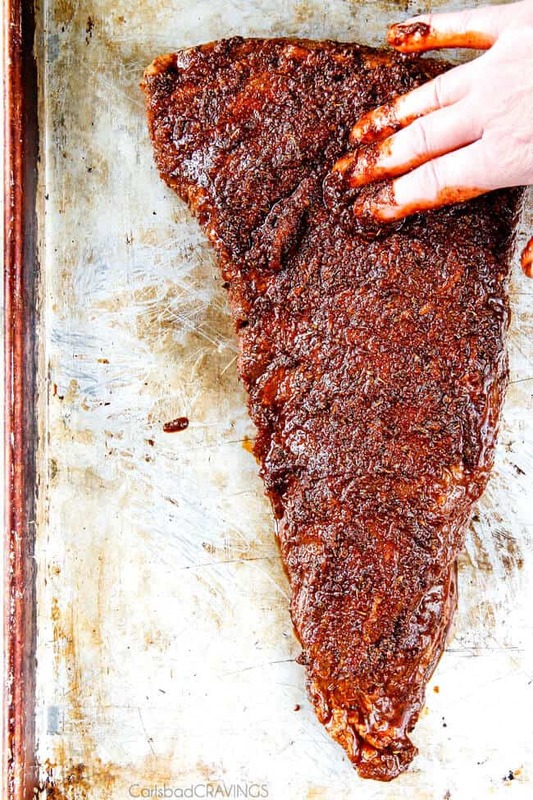 The incredibly juicy steak is infused with a quick whisking of soy sauce, Worcestershire sauce, orange juice, brown sugar and some homemade Cajun Spices that you let envelop your steak for 8-24 hours, the longer the better in my opinion. 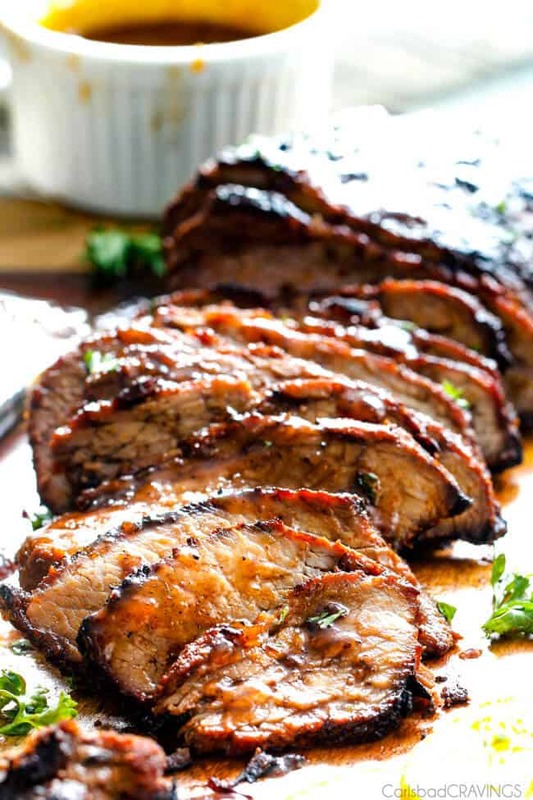 When you are ready to fire up the grill, you smother your steak in a custom delectable Cajun Spice Mix consisting of paprika, smoked paprika, chili powder, onion, powder, garlic powder, oregano, basil, thyme and of course cayenne pepper. I don’t find the mix too spicy but it does have a little kick to it – hopefully just the right amount for you and yours. I used my favorite cut of steak – tri-tip roast that I first mentioned in my Asian Steak with Cilantro Basil Chimichurri. 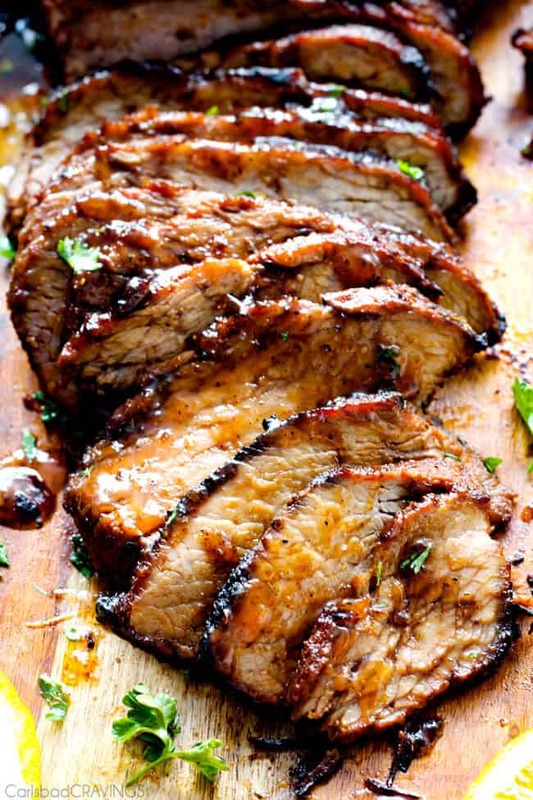 It’s a thick, incredibly juicy steak with rich flavor, relatively lean and inexpensive and soaks up marinades like a sponge. 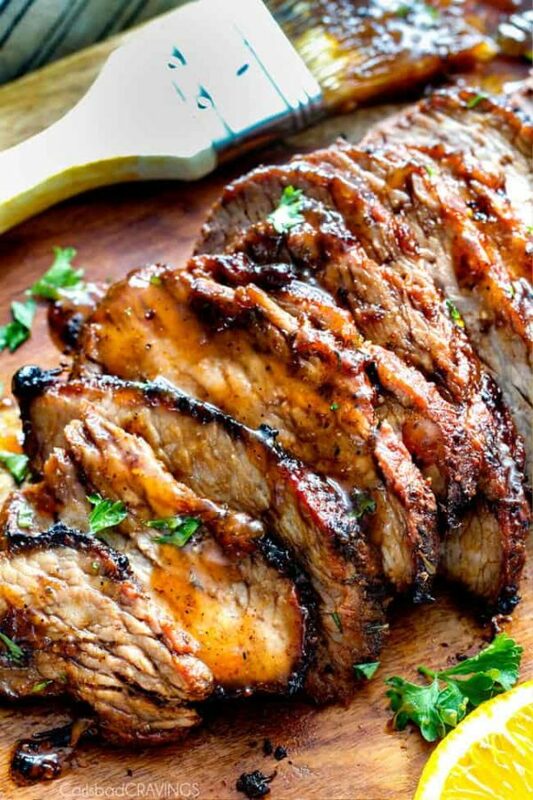 The term “tri-tip” is derived from the fact that the roast is triangular in shape (tri) and it is the tip of the sirloin (tip). This cut of steak can be harder to come by in supermarkets outside of California, although Costco nationwide always seems to carry it. If you can’t find tri-tip for whatever reason, feel free to use a thick sirloin or your favorite cut of steak and adjust grilling time accordingly. What Should I serve with with Cajun Steak? 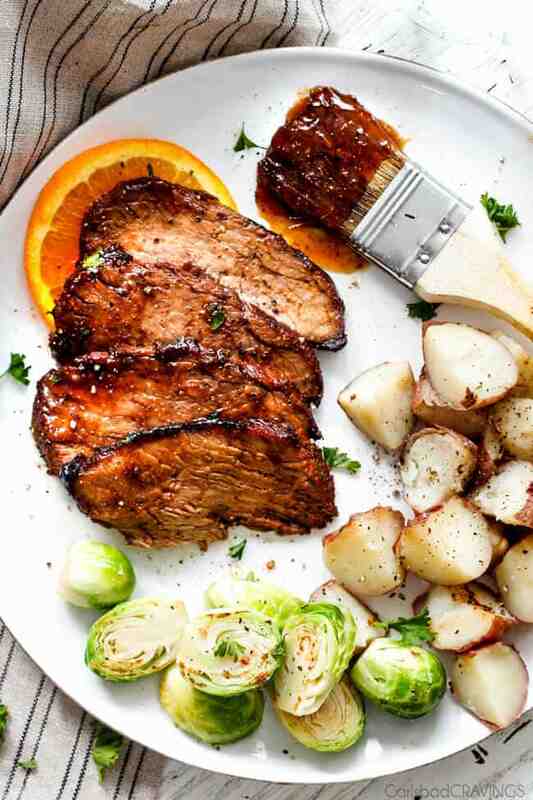 Want to try this Cajun Steak with Apricot Orange Glaze? Pin it to your STEAK, GRILL, or DINNER Board to SAVE for later! Spice Rub/Marinade: In a medium bowl, whisk together the Cajun Spice Mix. Add 2 tablespoons to a freezer size plastic bag along with all of the Marinade ingredients. Whisk together. Pierce steak all over with a fork and add to marinade. Massage marinade into steak and seal bag. Marinate 8-24 hours, turning bag occasionally. Store remaining Reserved Cajun Spice Rub in a sealed container/bag. Grill: Grease and preheat grill to 400 degrees F. Sear roast for 3-5 minutes per side, cover, and turn heat down to 350 degrees F. Grill for 15 minutes, flip, cover, and cook an additional 10-20 minutes, depending on the size of your steak cut and how well done you want your steak. Watch closely that your temperature stays around 350 degrees F.
Check for doneness with a meat thermometer inserted right in the middle of the steak. Thermometer should read: 135 degrees F for medium rare, 145 degrees F for medium. The outside of the roast will get quite dark with a charred crust which is exactly what you want with this cut of steak. Remove steak from grill, loosely tent with foil and let rest 10 minutes before slicing THINLY across the grain. Serve with Apricot Orange Glaze (recipe follows). 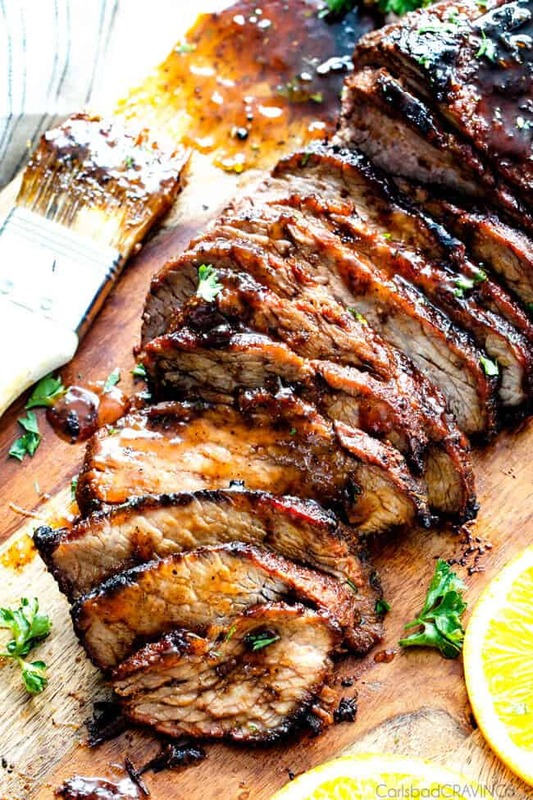 Apricot Orange Glaze: While the steak is grilling, whisk together all of the Apricot Orange Glaze ingredients in small sauce pan with reserved 1 teaspoon Cajun Spice Mix. Bring to a boil then reduce to a simmer until reduced and thickened. I am viewing this at breakfast and I am craving MEAT!! Your steak looks delicious and I have to confess we do love our meat. I’ve never tried using a glaze such as yours but we are always ready to try something new! Sounds great. Sending hugs!! Have a great day. Thanks Marissa! Its always nice to have something to satisfy those meat cravings when they hit – even at breakfast 🙂 I think you will really like the glaze – the sweetness balances out the spiciness of the rub beautifully! Hugs to you and yours! This looks crazy good and cannot wait to try it! Thank you so much for posting – all your recipes (and photos) are outstanding. You are too nice Raschell thank you so much! I hope you can try it soon and love it!! Have a great weekend! Hi Jen! What a juicy hunk of meat! I love Cajun/Creole flavors and can’t wait to try this! The sweet glaze would perfectly compliment the spices! And where is it written that you have to wait for a special occasion? I think every day is a special occasion we should celebrate! Hi Jen, can you suggest another cut of meat? The grocers around here (NW Florida) have never heard of tri-tips or even flat irons or skirt steaks. We just moved here from Colorado. The best we could find was flank steaks. I think that might work with some time adjustments. What’s your thoughts? Hi Jan! I would try a thick cut of sirloin. If that fails, then you could use flank steaks but just be aware that they are much thinner so I would use less rub and adjust cooking time accordingly. Hope that helps! Hi, I have my steak all ready and prepared but I don’t have a grill? Do you have any other suggestions of how to cook it? Thanks! Hi Brooke, sorry I am way too late in getting back to you as we moved this weekend and things have been a lot crazy! I hope it turned out delicious for you! You are so welcome Jennifer and I am drooling over making this into a sandwich!!! So, you specified DRY basil but what of the thyme? Is that fresh or dried? Hi Timma, yes it is dried thyme, I will clarify in the recipe. Thanks! I have no words to express…….I’ll only say its just look like heaven recipes. What kind of orange juice did you use? Maybe if you can specify brand? Thank you! Hi Shannon! It was some time ago but it probably was Simply Orange Pulp Free (Not from Concentrate) Orange Juice. enjoy! How tasty it looks in the pictures I immediately wanted to cook Cajun steak. Apricot orange glaze is definitely good combination for meat. Thx for sharing! You are so welcome Julia, I hope you can make it soon and love it! Hi there! 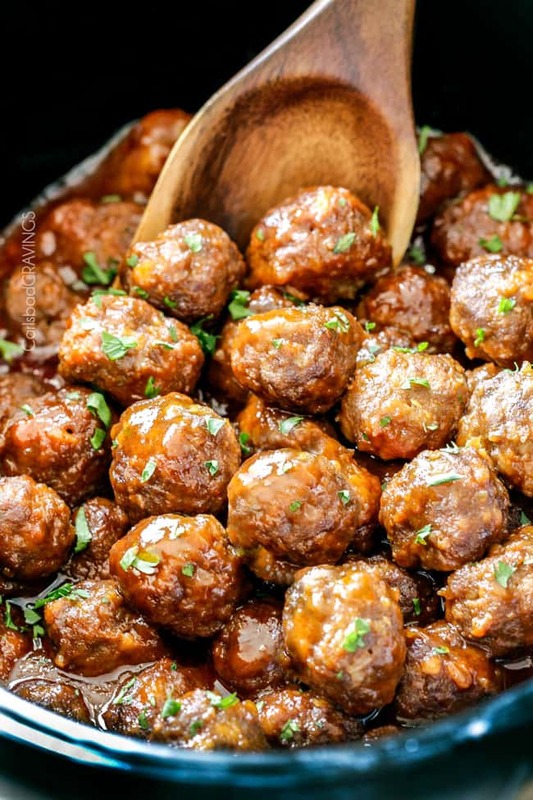 I’ve made this recipe twice now, and it’s amazing! With that said, I have a question about the spice mix. In the list of marinade ingredients, it says 2 tablespoons (in directions), and then in the directions it says to add 3 tablespoons along with the marinade ingredients. So does that mean 5 tablespoons TOTAL go in the marinade, or just 3 in the marinade and the other 2 are for the glaze and rub? Obviously I didn’t let my confusion stop me from making it (I’ve been doing the latter), but I just want to be sure. Thanks in advance! Hi Penny, I’m so happy you love this recipe! I just checked my original word doc of the recipe and it looks like I originally had 3 tablespoons in the marinade and changed it to 2 but did not change the directions – sorry for the confusion. There should be 2 tablespoons in the marinade and the rest goes in the Glaze. I hope that helps! We made this tonight and the flavors are outstanding! I couldn’t find tri-tip so we used super thick sirloin steaks. Maybe it was just our grill, but the cooking time was way too long, they were well-done in about half the suggested time. Still delicious though, we’ll definitely be making again and will try turning the heat down. Thanks for the recipe! Thanks so much Gina, I’m so happy you loved this Cajun Steak! Can I use store bought Cajun seasoning? 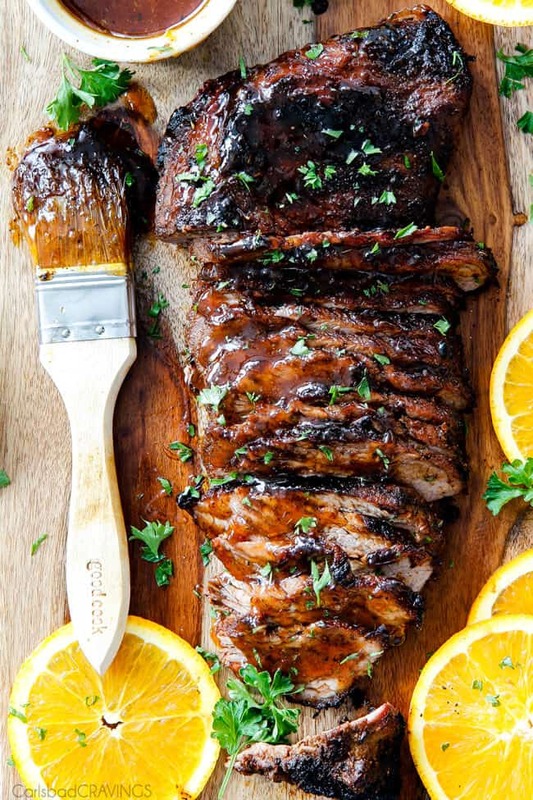 This cajun steak with apricot orange glaze looks delicious, I just want to devour it off the screen! Thank you so much, I’m excited for you to try it!